These were done with 18 gauge wire, but I would have preferred 16 - they are slightly flimsy so I had to work-harden the heck out them with my hammer. 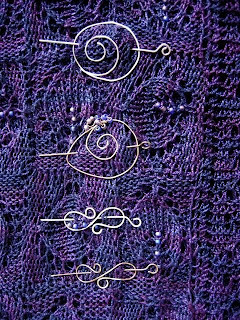 The spiral pin in gold has some of the stole beads wrapped around it. I may work on this one some more, since I'm not totally pleased with it. But at least Dianna will stay put.